Slow cooked, one-pot meals are simply the best. Fresh ingredients, a variety of vibrant colors, and that slow-building aroma that fills the house all day long?? It’s priceless! 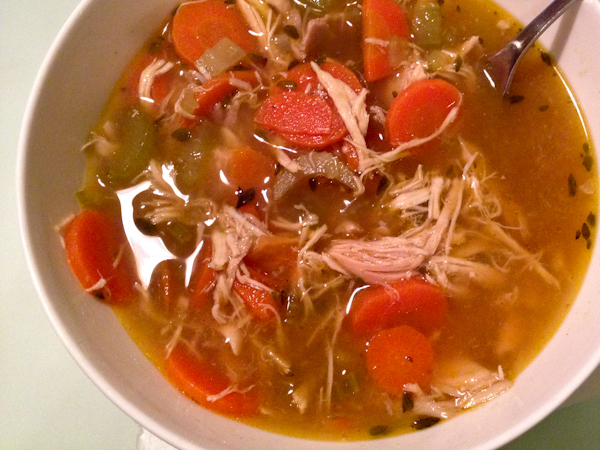 My Chicken No-Noodle Soup is a great weekend favorite of ours. Start it in the morning, and feel free to let it simmer super low all day long (though it can be ready in as fast as about 3 hours, including prep time). Or, more my style these days – start it at 7pm and treat yourself to a hot “tasters” cup around 10pm… it’s better than a hot toddy before bed! 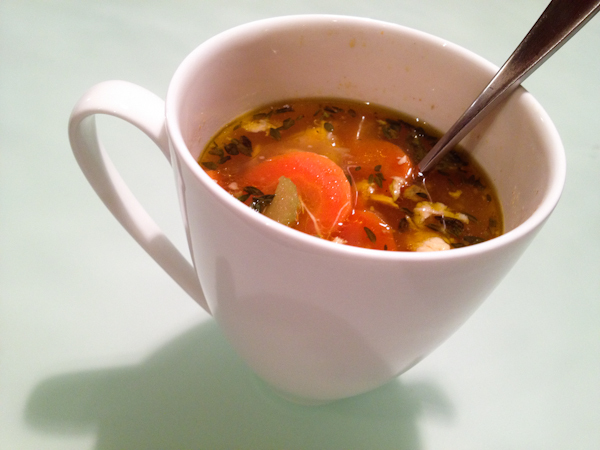 If you have kids, this would be a fabulous recipe (the soup – not a hot toddy) to cook with the whole family. I’ve heard that including your young ones (even toddlers) into the cooking process greatly increases food and nutrition awareness. Start with the grocery shopping – bring the kids and let them pick out the greenest celery, the most crooked looking carrots, and so on with all the ingredients. Teach them to look for local and organic, if available. Have someone with good motor skills take care of the veggie chopping and straining (details below), and let everyone participate as you add ingredients into the soup pot. It’s a labor of love, and I guarantee that you’ll have a home full of eager eaters when the soup’s done simmerin’! Have two large bowls and two large pots available. 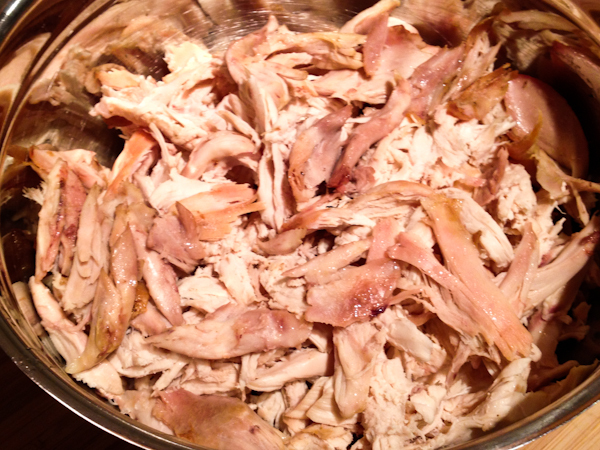 Separate the chicken meat from the carcass by tearing it apart using your hands. 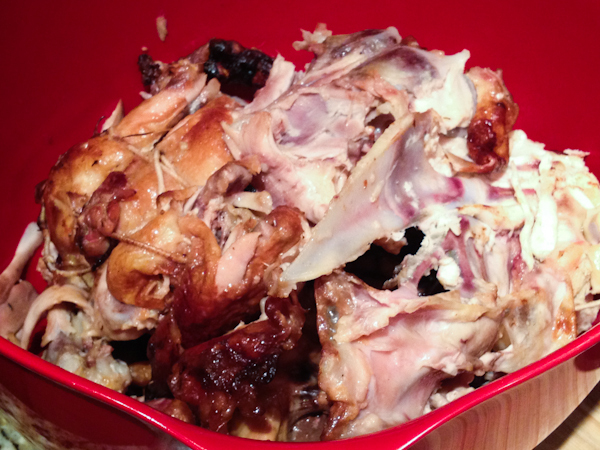 Place the torn edible meat pieces into Bowl #1, and the chicken bones, skin, and other spare parts into Bowl #2. On the stove top, have a large pot on medium heat. Place the chicken spare parts from Bowl #2 (all of them!) into the pot. Add the onion (peeled and cut in half), and the 3 quarts of vegetable broth. Allow this to heat up to a boil (may take 20 minutes or so). Once boiling, place the lid on the pot, reduce the heat, and simmer for 1 hour. 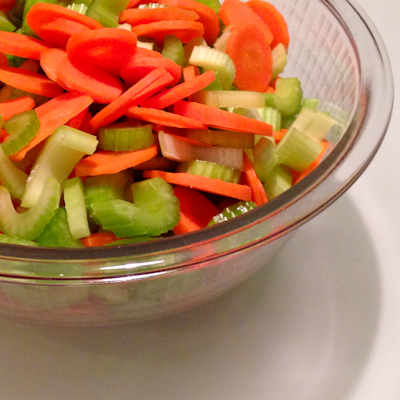 Chop your celery and carrots into thin slices. If the slices are too thick, no worries, the soup will just take longer to make (you can taste them as you go). 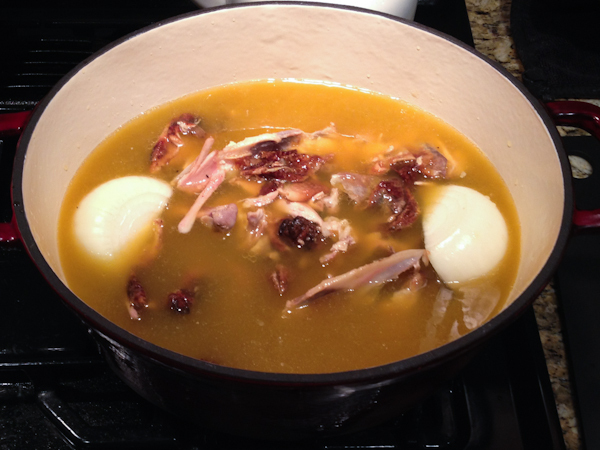 After your chicken soup stock has simmered for one hour, strain all contents of that pot over another empty large pot (using a colander) so that all that remains is the broth. Go ahead and toss the strained parts, they’ve done their job! 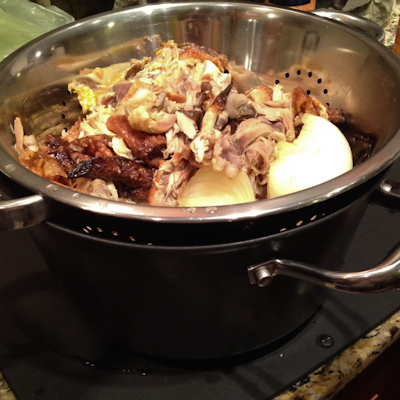 Place the second large pot containing your soup broth onto the stove top. Place the lid on the pot and simmer for 1 hour. Serve. Eat (careful – it will be HOT). Enjoy! 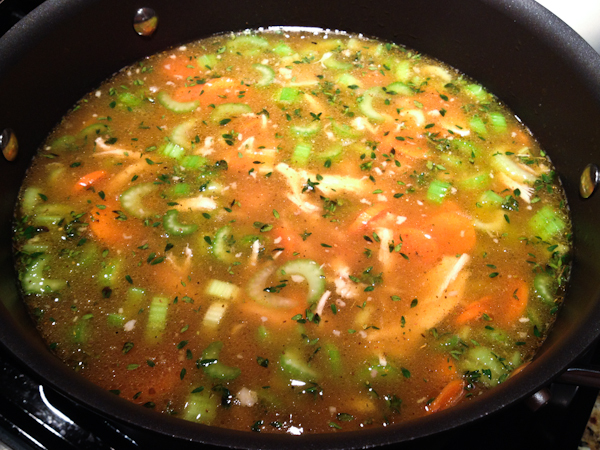 CLICK HERE FOR A PRINTABLE RECIPE FOR CHICKEN NO-NOODLE SOUP! I’ve scheduled this post for this morning hoping some of you will be inspired to make this recipe this weekend. If so, please share your experience! I would love to hear how it goes! This recipe has replaced my old chicken soup recipe. 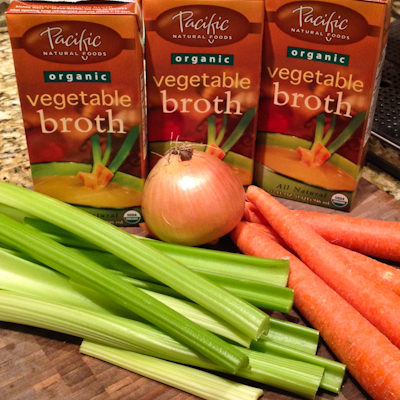 The bone broth is so rich and delicious. Thanks for sharing. That’s fantastic! Thanks for sharing Patti! If you ever want a “zestier” version, double the amount of old bay seasoning & add about a dozen grinds of fresh cracked black pepper. We tried this recently & it was delicious!